Currency Explorer is the absolute tool for traders that want to know with quantified certainty the currency strength & weakness of each currency and to trade these by using applicable strategies. Our machine learning models run and provide the strength/weakness of each currency based on multiple factors besides price action. It provides the trader with a QUANTIFIED result for the strength of the 8 most popular and major currencies (EUR, USD, JPY, GBP, AUD, NZD, CAD and CHF) with a scale from 0-100, on 5 out of many timeframes which a user selects! 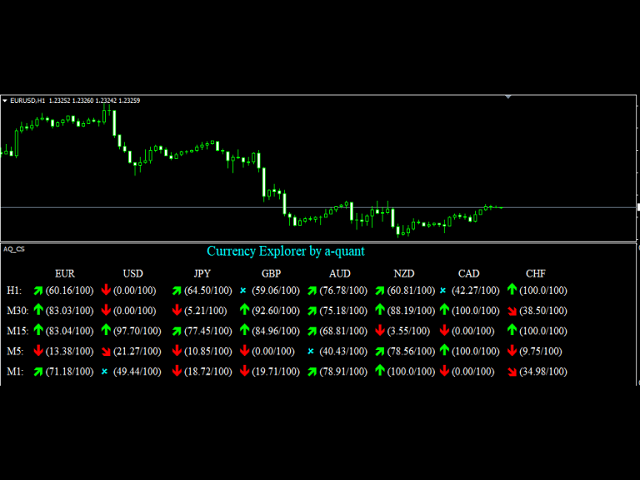 Users are able to customize Currency Explorer by selecting suitable timeframes and mode (FAST, MEDIUM, SLOW). Find the strongest currency (the one with 100.0/100) and the weakest currency (the one with 0.00/100). Open position in the direction of those two currencies based on which one is strong and which one is weak. For example, on our sample H1 chart, the strongest currency is CHF and the weakest currency is USD. Suggested position is SHORT on USDCHF. Watch currency strength of each currency and monitor a couple where the first changes from below zero to over zero while the second changes from over zero to below zero. It means that the first one is getting stronger while the second one is getting weaker. Open position in the direction of those two currencies based on which one is getting stronger and which one is getting weaker. Thanks for share free. This is a very useful indicator!